A few months ago I got a special gift of a really useful book and some wonderful wines to go with it. I used the red for sorbet, ended up just enjoying the white (a Riesling) on its own (sooo gooood) and stashed the sparkling in my fridge. For the holiday season. That book had given me some pretty good ideas and I couldn’t wait to put them to use. I was just waiting for the right time. What’s another name for sparkling wine? Champagne! And according to the book, champagne + popcorn = awesome. I was thinking candied popcorn…but I’ve been busy with other things and all but forgot to play with the idea when the time of year came around. Then! I remembered to check on the theme for this month’s Mystery Box Challenge. *GASP! * It’s popcorn! And if there’s one thing I know how to do, it’s put wine and other weird things in cupcakes! So how do you make a popcorn-champagne cupcakes? I used my regular white cake recipe, replacing the milk with champagne (like ya do) and replacing one sixth of the flour with popcorn flour. Yeah, popcorn flour. You can buy it commercially or you can make your own by air-popping popcorn and grinding it with a food processor, high-powered blender or spice grinder (for small batches only), then sifting out the larger and kernelly pieces. It’s a lot like powdered styrofoam, in that it sticks to EVERYTHING and is super lightweight, so don’t sneeze! Pop it in your mouth! If I were the type to host fancy New Year’s Eve parties, I’d absolutely serve these as an alternative to a toast at midnight. 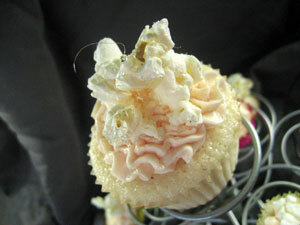 The champagne hits you first, then the crunchy popcorn and sweet sugar crystals. Buttery, boozy, snacky and sweet…sounds like all you could hope for in the new year. Preheat the oven to 350F. Cream the butter and sugar until light and fluffy. Combine the champagne and vanilla in a liquid measuring cup, set aside. Combine the flours, baking powder and salt in a medium mixing bowl and whisk or sift together. Alternately add the liquid and dry mixtures in thirds to the creamed butter, scraping down the bowl between each addition. Once everything is fully combined, add the egg whites and beat on medium-high speed for about 2 minutes, until the batter is light and airy. Spoon into lined muffin tins, filling the liners 2/3 full. Bake 10-12 minutes for mini cupcakes, 15-20 for regular sized cupcakes. Cupcakes are done when a toothpick inserted into the middle of one comes out dry (a couple clinging crumbs are ok, it’s a very fluffy sticky cake). Allow to cool fully before frosting. Makes 50-60 miniature cupcakes, about 12 regular sized cupcakes. Place the egg whites, sugar and cream of tartar in the metal bowl of a stand mixer and place over a tall saucepan of simmering water (don’t let the bowl touch the water). Using the whisk attachment, whisk regularly until the sugar dissolves and the mixture is hot to the touch. Move to the mixer and whip to glossy stiff peaks, then switch to the paddle attachment and turn on medium-high. Add the butter gradually. If at any time the buttercream breaks, becoming soupy- or curdled-looking, turn up the mixer a little and let it go for a while until it comes back together, then turn it back down and keep adding butter until it is fully emulsified in and fluffy. Beat in the champagne gradually, then the food coloring. Spread the popcorn in an even layer on a Silpat-lined baking sheet. Place the rest of the ingredients in a small saucepan and bring to a boil, covering for a minute or two until the steam builds up on the sides of the pot and washes any crystals down the sides. Uncover and continue cooking to 290F. Once it reaches about 285F remove from heat and pour over the popcorn, then stir to cover until the popcorn is fairly evenly coated. Allow to cool and harden completely before attempting to break up. 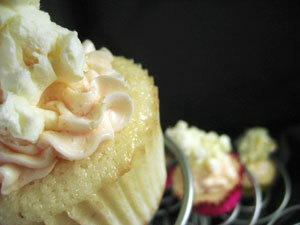 Pipe the buttercream into “kisses” on top of each cupcake with a piping bag fitted with a large star tip. 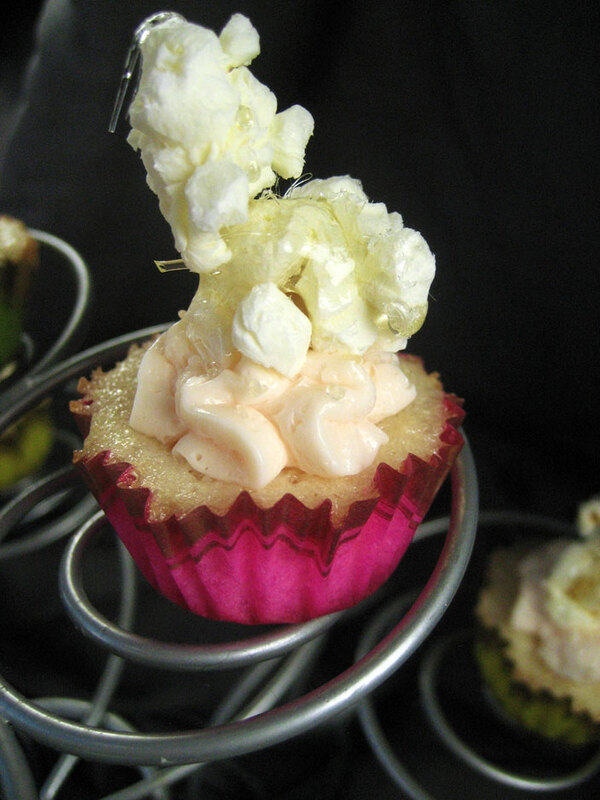 Sprinkle each kiss of frosting with raw sugar and place the candied popcorn on top (one piece for miniature cupcakes, three for regular-sized). 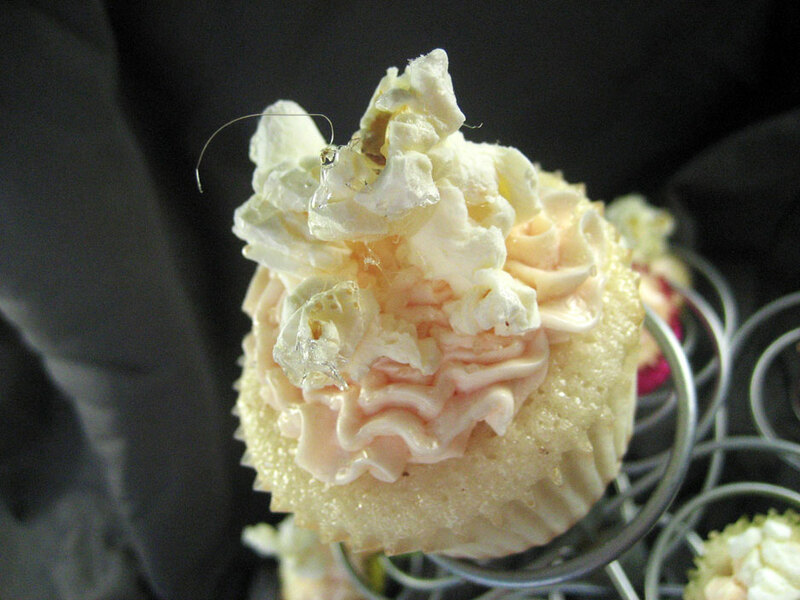 Serve immediately, or store the popcorn separately and add to the cupcakes shortly before serving – if you refrigerate the popcorn the sugar coating could get sticky. *Usually I try to avoid threads from developing on candied popcorn when I make it, but in this case I think it looks great, like bubbles floating in a glass. To achieve the threads, keep stirring the popcorn for as long as you can after coating with the hot sugar. Oh, and by the way, the above mentioned special book (What to Drink with What You Eat, if you didn’t click) is now available as an app! Great entry! I’m still scratching my head to come up with a really good creation for this one. Hope I make it on time :). Woah woah woah! 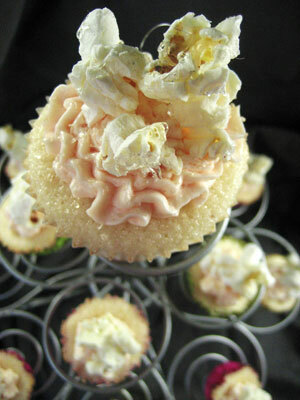 Popcorn champagne cupcakes? Be still my heart! These are adorable and sound utterly delicious. I’ve never heard of popcorn flour. That’s so cool! I love your idea of replacing the milk in the cupcake with champagne. As you do, indeed! Never heard of popcorn flour before this challenge either. Every day something new. So creative! Those sound awesome!